So, yeah, I'm a huge Android fan, that's no secret is it? 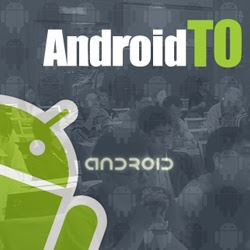 So getting a chance to get together with other Android fans is something I try to do. 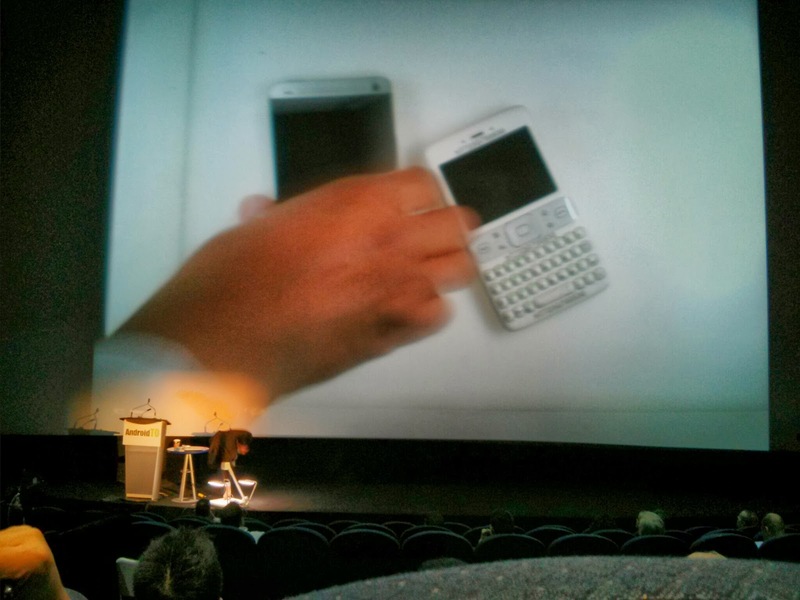 In teenie tiny Thunder Bay the Android audience is small, and getting a chance to see someone with a device I get excited. 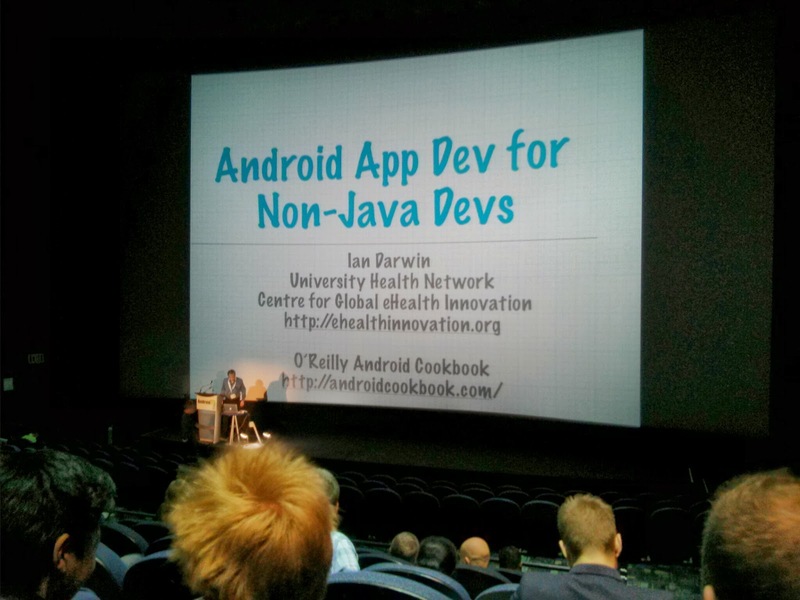 I'd love to be able to go to the big events like the +Big Android BBQ, but that's a far way to go. 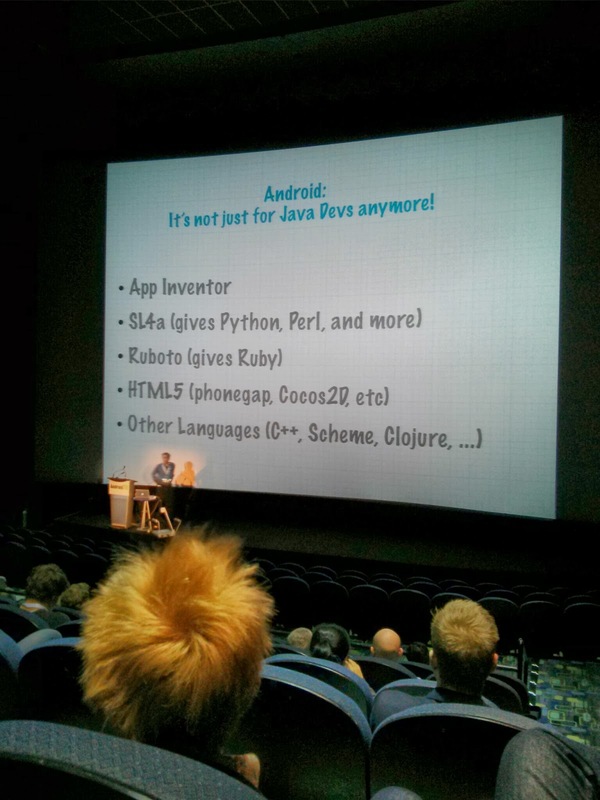 For any Canadian fan, you'll want to hit +AndroidTO. It's definitely developer focused, so the typical enthusiast may not be as interested to go, but if you can afford it (it's usually $100 to attend, and sometimes there've been 50% off codes shooting about) and the flight/accommodations, it's definitely worth it. So, here's my recap of the event. TL;DWR? Neat displays - the Sony Z Ultra is AWESOME, got to try Google Glass, got to meet +Amanda Blain, finally hung out with fellow writer +Martin Guay, got to meet my LG contacts (who were very awesome), and cool speakers showcasing how cool Android is. You can also check out Martin's recap here. First off, you get to be around other people who appreciate Android, that in and of itself is a welcomed feeling for a guy like me. Sure, there are some who are using iPhones and BlackBerries, but they're developers who have to develop for multiple platform so it can be forgiven. I won't bore you with my Toronto adventures. For some reason every time I go there, there's an adventure. I will say that I got to get out to the LG 'plant' out by the 400 highway, and got a cool shot of their wall of phones in the lobby. That was as far as I got... that day. Once at the conference you're greeted by the staff and given a swag bag. In it we got a t-shirt, pens and coupons on some items, including a KitKat! 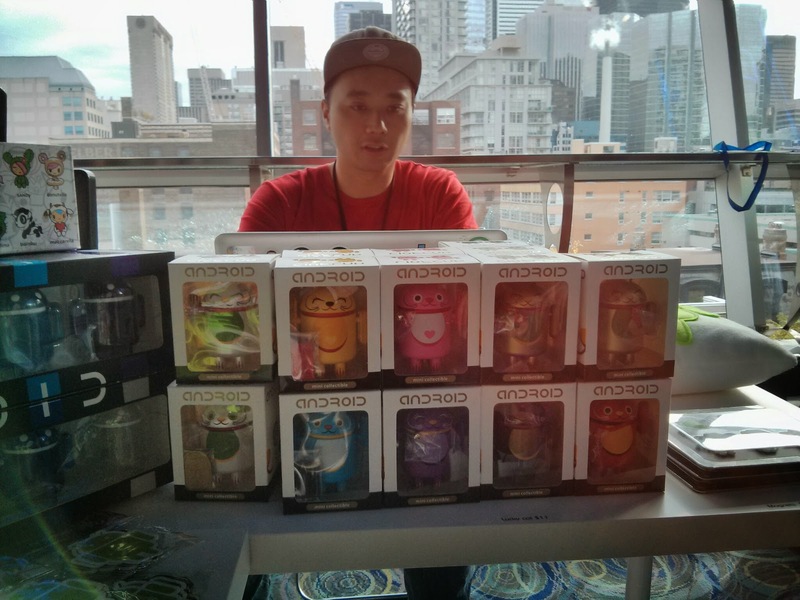 Head over to the Rogers booth early enough and you'll get a free customizable Android figure. Gotta decide what to make with it... maybe I'll let +April Gray work her magic for me! Before the keynote speech I checked out the Z1 and the Z Ultra at the Sony booth (dear Sony, your booth gal has a bit of an attitude), and then the Note 3 and Gear at the Samsung booth. 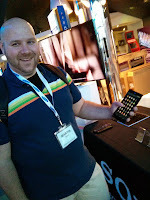 Cool devices all around, but I just loved that Z Ultra. It was up for one of the prizes and all day I had my fingers crossed. We also checked out the other booths before heading into the theatre for the opening. +Mark Reale led off the introductions for the 4th annual event reminiscing how the event has grown to over 600 attendees this year. 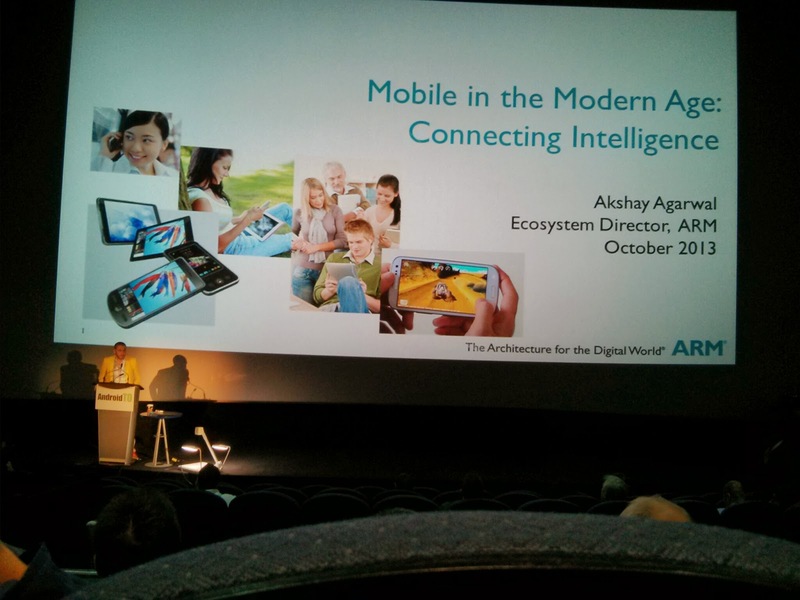 The first speech was Akshay Agarwal from ARM who discussed the importance of developers. He started it off by showcasing a mysterious device next to his current one. That's the prototype Android device from way back. Before the G1... a little bit of nostalgia right there. Just about every device that has run Android from its inception has been on an ARM device; and as he put it "developers make the systems better, make the devices shine". Which is so true. He praised Android for it's vast array of devices, which has been some of the reason that it has given Android its growth. 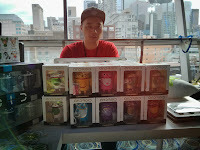 He even showed potential for more 'devices' to run Android, and I even spotted a Tassimo. 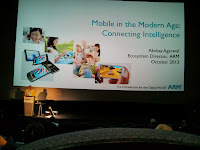 He stated that mobile gaming should reach $17B by 2017, and the new emerging field of 'wearables'. Wearables are allowing app developers get more 'visibility' for their apps. 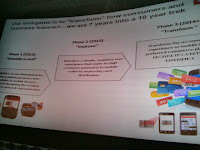 Which will not only make the devices and the experiences better, but will help to build your 'brand' for developers. 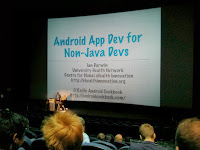 Next up I went to listen to Ian Darwin (author of the Android Cookbook) who tried to dispel the myth that to develop Android apps you HAD to use Java. It's probably better, but there are other methods: App Inventor, SL4a, Ruboto, HTML5 (using phonegap or Cocos2D) or even C++ with different translators. He briefly talked of each and gave some of the pluses and minuses of each system. 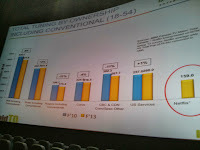 For a non-developer/programmer, the App Inventor looks the most promising. I remember when Google came out with it and gave it a shot, but life got busy, so I stopped... then Google stopped supporting it and now MIT has taken it on. 3rd speaker of the day for me was Adam Shutsa from 500px (who I didn't realize was a Canadian company ... #til). 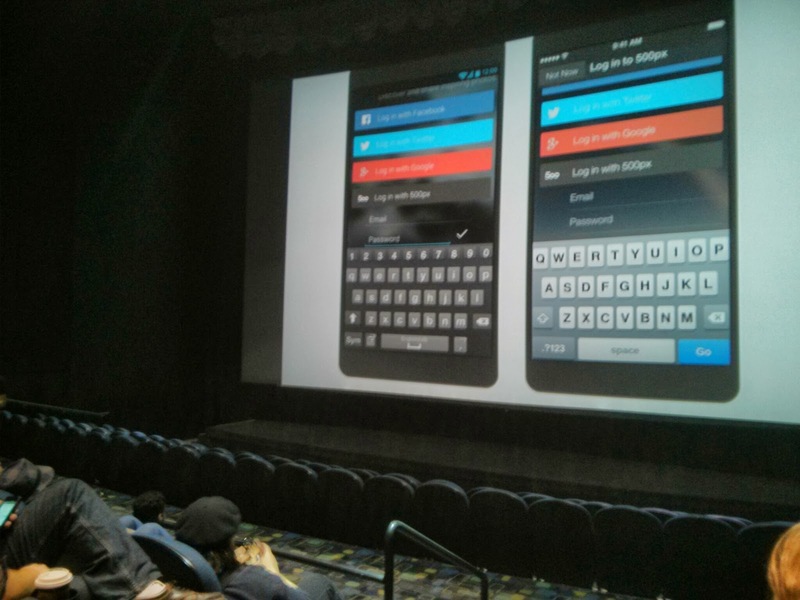 His speech centred on how important design is to an app. Essentially your app should have Familiarity, Trust and Comfort. For 500px it was important that the app be similar to their web service, to provide familiarity with their users. It only takes one mistake in the design to lose a user. Your team should have goals in their designs, and always check back that what you're implementing matches those goals. He gave the example of trying to design their 'flow' section as 2 columns, but the goal of having predominant beautiful photos would be comprised (the photos would end up being to small). What was an interesting point was ensuring specific OS features. The example is in the picture to the left. On default Android (apparently they weren't showing it, but I know I've seen it) there is no 'done' key like on iOS, so they had to implement a checkmark to indicate completion. Little things are what matters. Then it was lunch. 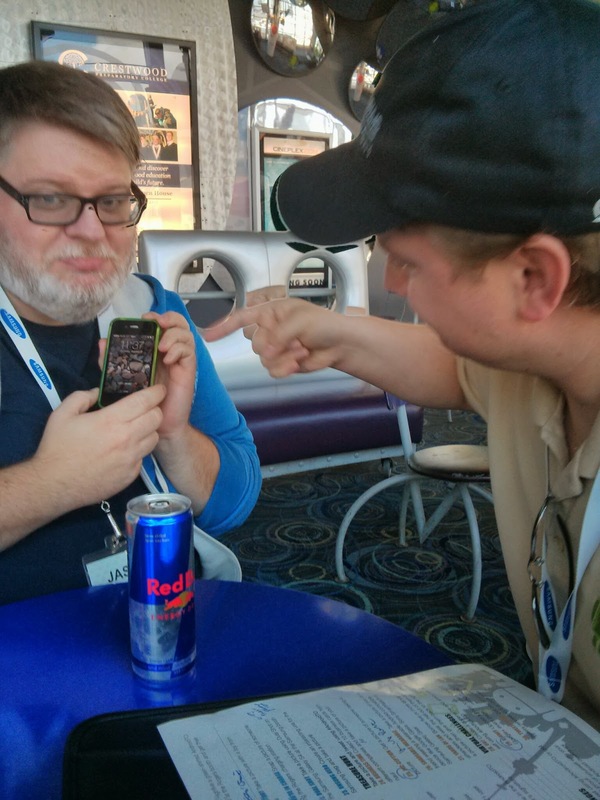 Time for me to complete some challenges like high-5 a greenshirt, shame an iOS user (sorry Jason!) and several others. 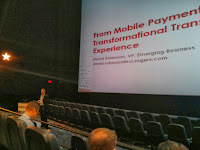 After lunch I went to David Robinson (Rogers) and his discussion on the future of NFC and mobile payments. I was really interested to hear, but somewhat skeptical seeing it was from Rogers. Then ... no offense David, you really came off as pompous. Primarily he talked about how Rogers is moving into the banking realm, and have built their own new system to process payments. It took forever to do, and only works on 1 type of SIM with one bank ... but they wanted to do their own (and do it right he said) and not plunk into something else, because this way it would be scalable (for them... that's my interpretation). 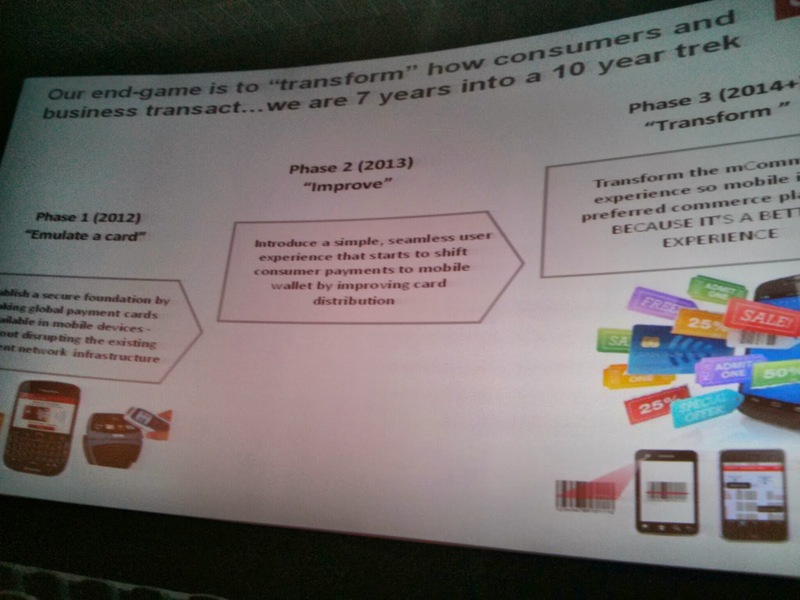 He discussed the potential for the growth on mobile payments, and even mobile security. Potentially having the secure element on the SIM (as the carrier they believe it should be there and not the device so it's transferrable) means you could have a wealth of 'authenticable' information. For example he gave the notion of a girl who goes to a bar and shows her ID. The bartender now has all of her info, her photo and date of birth, address, etc... Sure he needs to know what she looks like, and her age, but potentially a system could come about where she taps her phone, and on the screen pops up her photo and a "Pass/Fail" for age of majority. 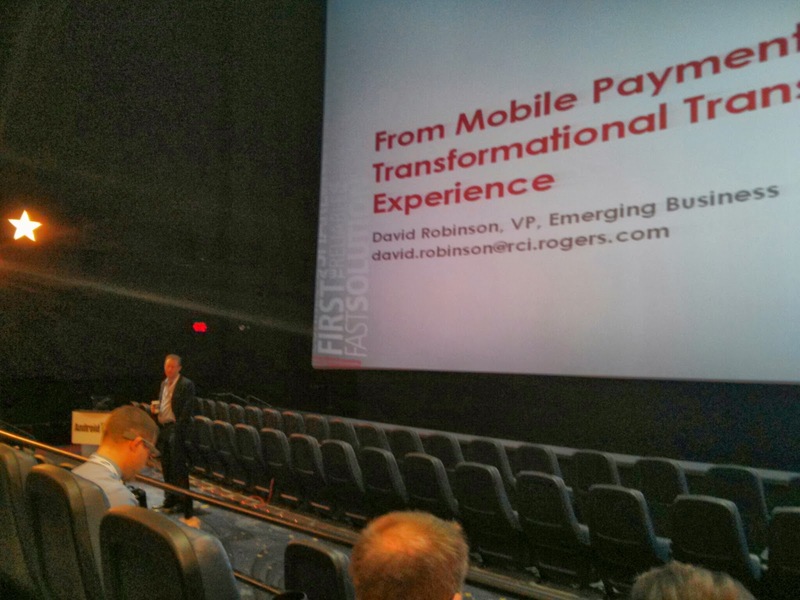 Rogers has considered Google Wallet, but which? 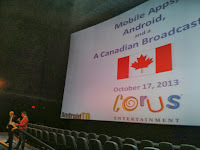 The business end of Android intrigued me enough to stay for the next presenter who was Scott Dyer of Corus, the broadcasting company. My kid watches enough of those channels/shows, that I thought it'd be an interesting bit to see their interest in Android. It was interesting. 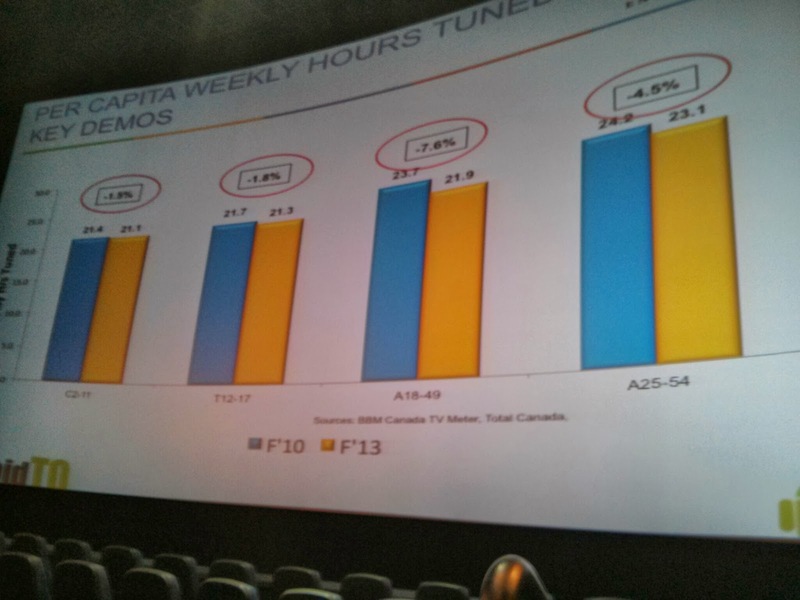 Mostly led by discussion on how the 'watching habits' of Canadians have changed and gone away from the traditional 'tube', and more to where the "TV is just another monitor... whether it's YouTube, Netflix, VOD, Chromecast, etc... it receives whatever it is you want it to display". The interesting thing I took from Scott's speech was how they look at the Android system as a great opportunity for them to test their markets. Sure it'd be easy to just make an app like Netflix and display their content, but that would ruin their partnerships with current providers, so instead they develop apps as ways to get further insight on their viewers. Plus, they would prefer to have independent developers do the apps than have 'in house' folk, because independents tend to have better creativity. 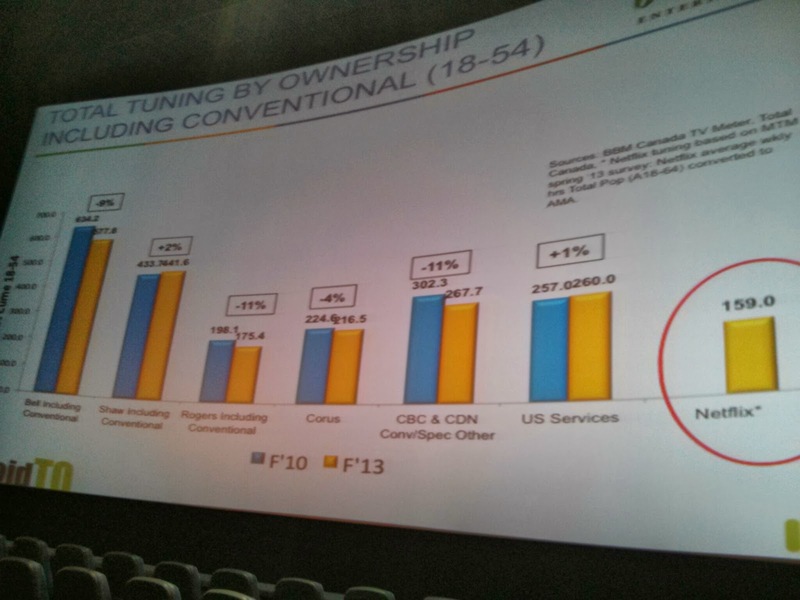 There was some discussion over the ideal of licensing versus contract, etc... a bit technical, but I liked the idea. 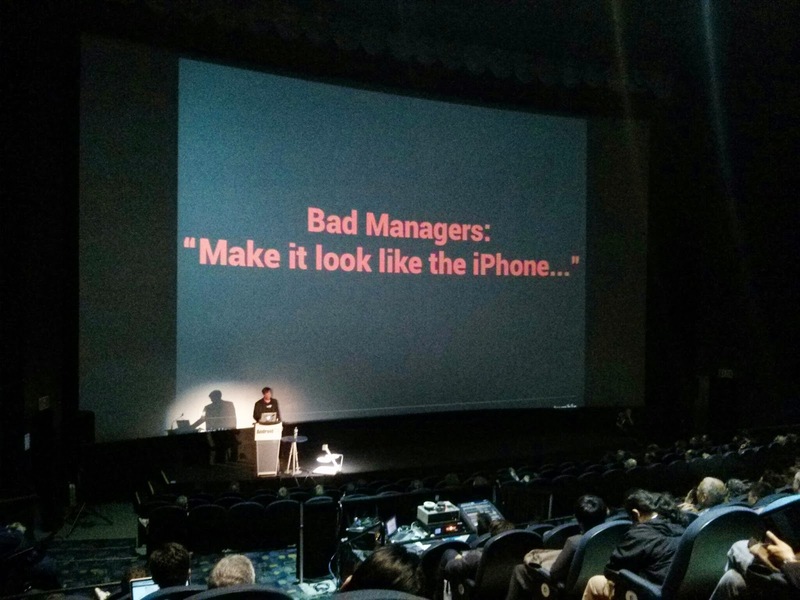 He boiled his message down to "Follow the audience... don't expect them to follow you." 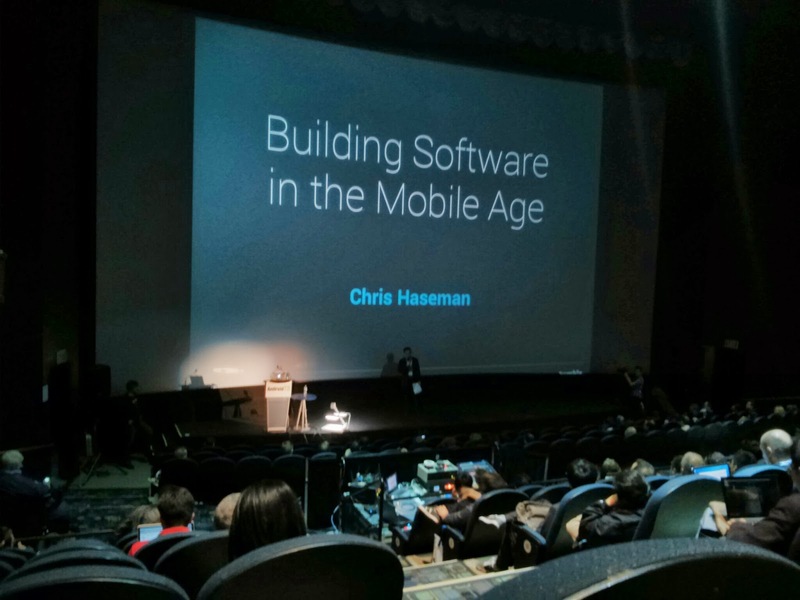 That was it for the 'tracks', now back to the main for the final keynote speaker, +Chris Haseman (Tumblr). I really enjoyed his speech from last year, and this year's did not disappoint. He had a great energy about him that displayed his obvious passion not only for his product and development, but for trying to pass on solid information to others. 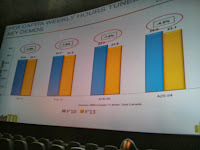 He talked of how Tumblr has grown and how much effort they put into their apps. In fact, one week is taken looking at just margins. I thought it was a nice compliment. 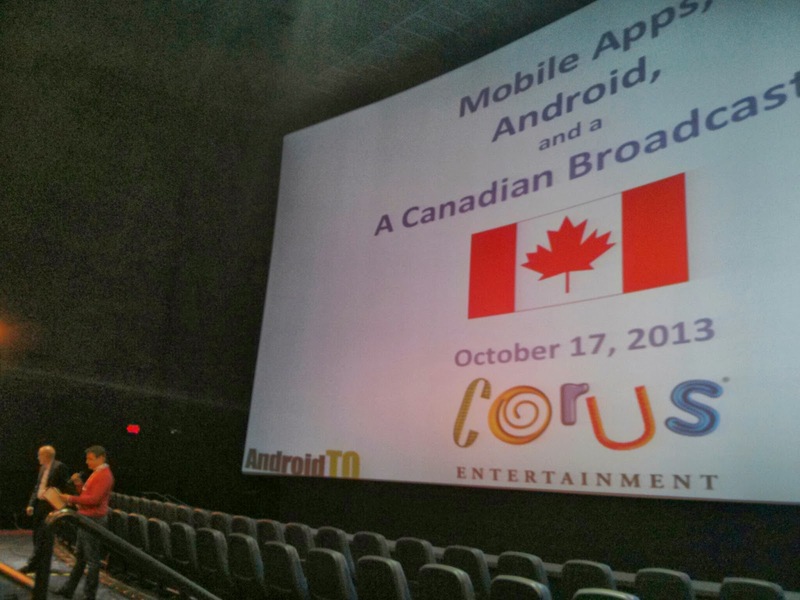 Before keynote, Rogers spoke and reminisced about the early Android Enthusiasts group. Something I remember even in the reaches of Thunder Bay. The early days of Rogers releasing the Magic and the Dream with 1.5, and then 1.6 came out; and folks like +Michael Schmidt and +Puleen Patel were brought to a war of words with Rogers about who should bring the 1.6 - it was then that Rogers reminded us of the Kitkat in our bag, and how they bought them so you can say "Rogers brought Kitkat to Androiders first". Then it was time to announce the prizes (I didn't win anything) and then enjoy some camaraderie after. I got to meet +Macy Kuang and try out Google Glass. 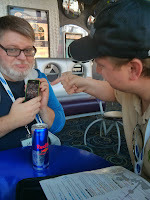 Discussion with others about the pros/cons of Google+ and the contacts from LG came out to meet as well. A great time was had by all I would like to think! I'm definitely going to book 2014 as soon as they announce! I have more notes on the speakers I went to if you wanted to ask me anything, please go ahead.